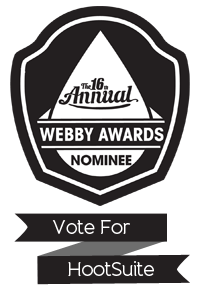 We’re pleased to announce HootSuite for iPad has been nominated for the 2012 Webby Awards! HootSuite is honored to be 1 of 5 apps selected in the Social (Tablet & All Other Devices) Category alongside great apps like Showyou, SoundCloud, IntoNow, and Skype. Voting is now open and ends April 26. Please help us take it home this year by casting your vote. Simply select HootSuite on the ballot then sign in using your Twitter, Facebook, or Google accounts. Alternatively, you can also register with an email address. Once you’ve made your selection, click the “Confirm Vote” button. Moving into its 16th year, the annual event recognizes excellence on the Internet and is presented by The International Academy of Digital Arts and Sciences which includes Web experts, business figures, luminaries, visionaries, creative celebrities, and former Webby Award Winners and Nominees. If HootSuite wins, what should we say? Let us know your 5-word suggestions by tweeting at @HootWatch with the hashtag #5HootSpeech. In addition to the tablet nomination, HootSuite for iPhone was also selected as an Official Honoree. Have you tried HootSuite for iPad or HootSuite for iPhone? They’re both free and available at the App Store. If you haven’t already, give them a spin! We hope you vote for HootSuite and appreciate your continued support. Don’t delay as the voting period ends April 26th, 2012. Tell your friends!